The Hackett Property is located in northwest B.C. 's prolific Sheslay district includes a very strategic claim package covering the entire eastern border of Doubleview Capital’s HAT Property where a significant Cu-Au porphyry discovery was announced in January, 2014. The neighboring HAT Property owned by Doubleview Capital Corp., is recently optioned to Hudbay Minerals Inc., whereby Hudbay can earn a 65 % interest through expenditures of $40 million and completing a feasibility study. 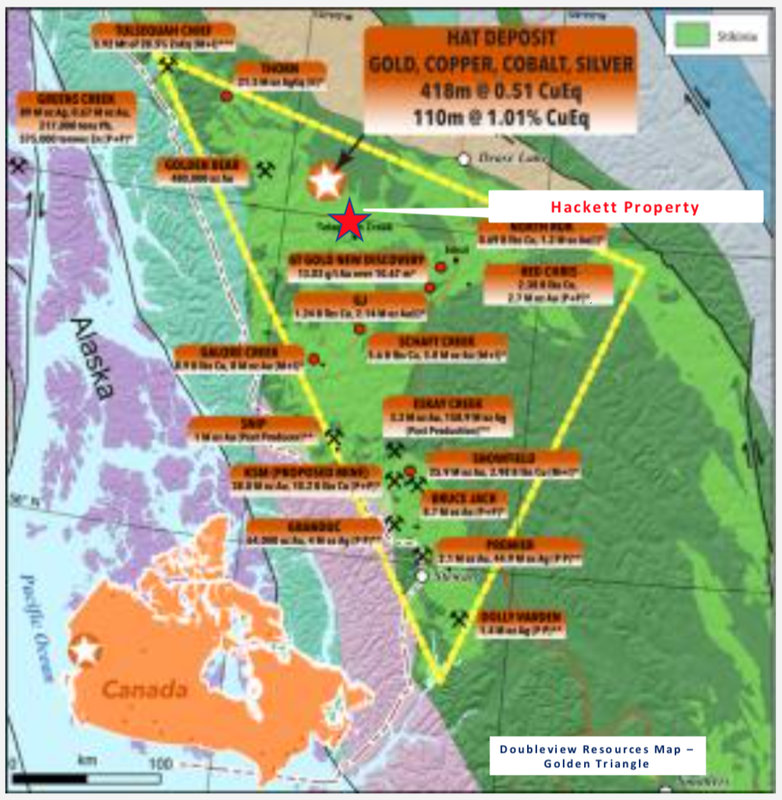 Doubleview discovery holes HAT-08 and HAT- 11 (see DBV news release January 20, 2014) were drilled approximately 1,000 metres west of the Hackett boundary. Notably, approximately 300 metres west of the Hackett western claim boundary, on the Doubleview claims, a reported historical assays from the Hoey showing included high- grade gold up to 21.3 g/t (Minfile #14802). In 2014 prospecting of the steep ravine on Big Creek on the western flank of the Hackett property, returned strongly anomalous gold and copper values in rock grab samples. The initial mineral showing discovered returned 24 and 594 parts per billion gold, and 598 and 2970.0 parts per million copper, respectively. These initial sample values are considered to be very significant and may represent the extension of porphyry style mineralization indicated in surface sampling and diamond drill holes on the contiguous HAT property. Website Copyright © Glacier Lake Resources Inc. All rights reserved. All photography original material with exception to those noted.